Summertime is here in Islamorada. And that means warmer days, rising water temperature, less wind which makes for beautiful days out on the ocean. And most all offshore fisherman have one species at the top of their target list , the most popular pelagic gamefish: the mahi mahi, a fish so nice, they named it twice! The mahi, dorado, or dolphin-fish, whatever you wish to call them. They are the backbone of recreational fishing here in the Florida Keys. With their vibrant colors of blue, green and yellow darting through the water, they will change colors from a green-yellow to neon blue with black vertical stripes when they are excited in feeding mode. It is a sight you’ll have engraved in your memory forever when you see a lit up bull head come waking with his head 3 inches out of the water, his peck fins straight out horizontal, his dorsal standing straight up from tail to atop his blunt head and the throwing a wake like a speed boat; he changes ten colors from yellow to green to the most amazing electric neon blue. Then you watch him inhale your ballyhoo the mate just cast perfectly underneath a diving frigate bird, pulling off fighter jet maneuvers to try and get a flying fish the dolphin are chasing into the air. The angler comes tight on the rod and the slammer bull head starts dumping drag and jumping all about…it’s dolphin season boys and girls, come and get ‘cha some. Dolphin roam the open ocean on a continuous hunt for food. 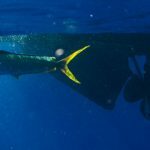 They are relentlessly on the move and are caught all around the world, but one of the largest bodies of mahi can be found here off the Florida Straits from late May – August. They can be caught at any depths, from the deep edge of the reef 100’, all the way across to the Bahamas. We start looking hard when we find where the Gulf Stream current starts, typically somewhere between 300’ – 800’. A change in water color or sargasm weed that is lining up parallel, not inshore/offshore, and taller waves are good indicators of where the current begins. Upon hitting the current, we pull back the speed and put out some trolling gear. When we are fishing for dolphin, a typical spread is a pair of flat lines staggered with a blue/white feather on one flat and another slightly larger lure on the other flat line. I like to put a naked, or chugger headed ballyhoo a good distance back on one outrigger and leave the other side of the boat open for sight casting. Once a school of dolphin is located, you can usually get them to stay behind the boat by offering some squid, chunks of bonita, pilchards or any live bait. As we come upon a school, either by getting a strike on the troll or sight casting and connecting with a spotted swimmer from the tower, once one is hooked, standard procedure is to clear the flat lines. Often the school will follow the flats right up behind the boat. Get the trolling gear up and out of the way and switch over to 20 lb. spinning outfits bimini twisting and splicing the double line to a 50/60 lb leader with a 5/0 or 6/0 mustad 7766 hook tipped with a squid, ballyhoo, chunk or live bait. All can be purchased from my favorite local outfitter, Tackle Center of Islamorada. We flip out the spinner to a fish behind the boat, you want to have the bail open, let the fish eat, swim off with your bait for 2 or 3 seconds, then shut your bail, reel fast and there you go! Mahi madness!! By leaving one fish hooked in the water, the others in the school will stay nearby. Take your shot at one fish at a time and re-bait and hook another one, repeat… schoolie wars. A school that is good and fired up will eat most any bait offered. Our typical bait cooler for a day of mahi fishing is 10-15 rigged ballyhoo (some skirted, some naked), 20 or so smaller ballyhoos for casting, a box of squid and a bag of chunks (cubed bonita or skipjack). Ideally, I like to have a bait well with plenty of live offerings for the stubborn fish. Schooling dolphin typically run in smaller sizes with your smaller shakers being around a pound to your nice migrating, heavy lifters in the 8-12 pound range. The bigger dolphin tend to be loners or swimming in pairs or small packs. These larger ones, slammers, are 20-50 pounds. A 50 pound dolphin is quite a ride! You hear of 50 pounders and a few that go up to 60 pounds and every once in a while someone will catch a dolphin over 70 pounds, very rare. Locating schools of dolphins requires being good at reading birds and how they act. Your best dolphin fisherman are experts in offshore bird activity. They can tell you what species of bird and what kind of fish they are tracking. That is an art all in itself. We are looking for birds hovering, usually tracking SouthWest along some sargasma weed. June means great weather and good fishing but also a lot of boats out there. Common courtesy goes along way on the water and it is just not the right thing to do to come up on a boat obviously stopped catching fish out of a school and start trying to catch the same fish. Unless you know the other captain or have permission this is a not a good way to make friends. It’s a big ocean out there and there will be other opportunities. I hope everyone has a safe and successful mahi fishing trips this summer, we’ll see you out there.